GameSpy online services have been shut down (see Network for solutions). A demo is available, but the single-player portion cannot initially be played due to a date delimiter that does not allow it to run after November 1, 1998; there is a patch that fixes this. Owners of the Loki Software Linux port of the game should consider using the installer from LIfLG, if you wish to run the game on a newer system. It is currently in beta. 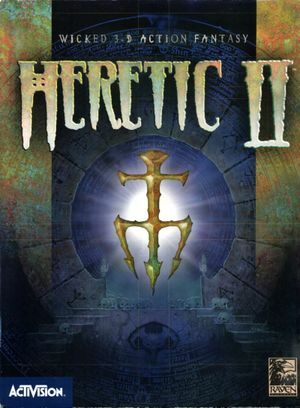 An Amiga version is also confirmed to exist, released in 2000. Community patch that includes Raven's Enhancement Pack v1.06 alongside support for widescreen resolutions and other changes. This game does not follow the XDG Base Directory Specification on Linux. See Field of view (FOV). Install Enhancement Pack v1.07 into <path-to-game>. Enter your resolution into the Width and Height fields and press OK. Launch the game and either open the console with ~ and type in: set vid_mode 3 or select the 640 x 480 resolution in the Video Settings menu. Open config.cfg with a text editor. 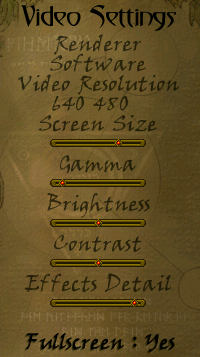 Find set fov and enter your chosen FOV. 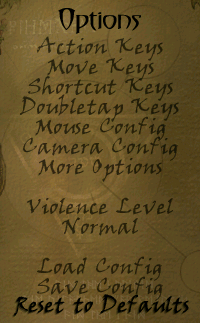 General settings, including categorised inputs. Under setting "Captioning" in Options > More Options; only toggles in-game cutscene captions. A3D 2.0, EAX 1.0 (patch 1.04 required). GameSpy services have been shut down; see GameSpy for workarounds. This happens due to the fact the game uses OSS for sound output only. The software is not updated frequently. Install the osspd package (Some distros like ArchLinux refers the package as ossp) and enable/start the osspd/osspd.service service. This page was last edited on 28 March 2019, at 18:22.